Ahead of Saturday’s clash with promotion-chasing Mansfield Town, David Buchanan admits the Cobblers ‘owe them one’. But he also knows that exacting revenge is going to be easier said than done. Back in September, Town endured arguably the lowest point of a season that has seen quite a few of those when they were humbled 4-0 at Field Mill by a rampant Stags outfit. The Cobblers hardly got out of first gear in a thrashing that could, and probably should, have been by a bigger margin. The defeat proved to be final nail in the managerial coffin of then boss Dean Austin, with the loss the fifth in the opening 10 matches of the campaign. After seeing his team embarrassed, the under-pressure Austin launched into a blistering post-match attack on his players - and was sacked a day later. It was a painful day for everybody concerned with the Cobblers, and Buchanan is keen to set the record straight at the PTS Academy Stadium on Saturday. “I think Mansfield will be a tough game, and we all know what happened when we played there,” said the Town left-back. Mansfield have overcome a recent stutter in form to win their past two games and currently sit pretty in second place in the Sky Bet League Two table. David Flitcroft’s team are 11 points adrift of leaders and champions-elect Lincoln City, but only one clear of fourth-placed Bury, who have stumbled badly in recent matches. With five games left, the Stags can’t afford to make any slip-ups, and Buchanan feels the fact they will play positively could be a good thing for the Cobblers - even though they are a team full of strong performers. “Mansfield have some real quality in their dressing room, they are sitting second in the league at the moment and aiming to secure promotion,” said Buchanan. 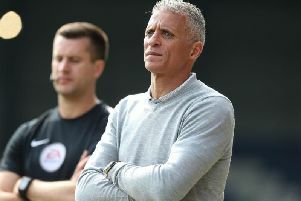 “They have a number of players in their team that got named in the EFL League Two team of the year, so we are going to give them the utmost respect, and the respect they deserve. “But they are going to come here and go for the win, which might be better for us. “The teams we have played against recently, certainly at home, have sat in and we haven’t really been able to break them down. “I know Dave Flitcroft well, I played with him, and Ben Futcher, the assistant manager, and make no bones about it, they build their teams off going out and getting on the front foot. “They like to get after you, and they have threats all over the pitch.